IDF attacks Hamas military post after terrorists throw explosive devices at the security fence along the Gaza border. 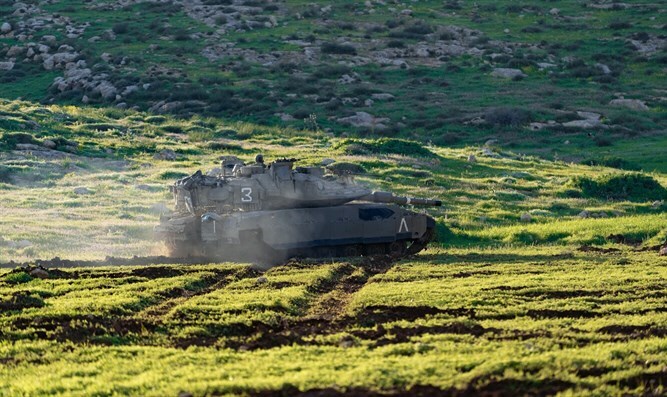 An IDF tank on Friday evening attacked a Hamas military post in the northern Gaza Strip, the IDF Spokesperson’s Unit confirmed. The attack was in response to explosive devices that had been thrown by terrorists at the security fence along the Gaza border during the evening. Earlier, some 200 terrorists opened fire at the border fence in northern Gaza and also fired a number of shots at Israeli forces. About 500 explosives and grenades were thrown towards the fence and the Israeli troops. There were no casualties among the IDF soldiers. The violence along the Gaza border was the latest in the weekly riots, dubbed the “March of the Return”, which have going on every Friday since March 30, 2018. Gazan terrorists are planning additional riots on Saturday, as they mark the one-year anniversary of the “March of the Return” protests as well as Land Day. Earlier, the head of the Coordination and Liaison Administration in Gaza, Colonel Iyad Sarhan, directly addressed the residents of Gaza and called on them to distance themselves from the elements and acts of terror. The violent riots continued on Friday despite earlier reports that Israel and Hamas, with Egyptian mediation, had reached preliminary agreements on restoring calm along the Gaza border.